NEW YORK — The artistry and craftsmanship of Native-American baskets is enough to make them important and desirable works of art in their own right but when you factor in the stories they tell of the culture and daily lives of their makers, their legacy in the annals of American art becomes that much clearer. The Native-American basketmaking tradition spans America, from the Plains to the Northwest Coast and the East Coast, and goes back centuries. While basket were initially woven to be utilitarian items — burden baskets to transport things, jar-shaped baskets to store water or grain, and shallow platter-shaped baskets as serving dishes — they were also elevated to an art form, incorporating geometric patterns, tribal iconography and symbolic motifs. Today, they are highly coveted by collectors and museums alike. 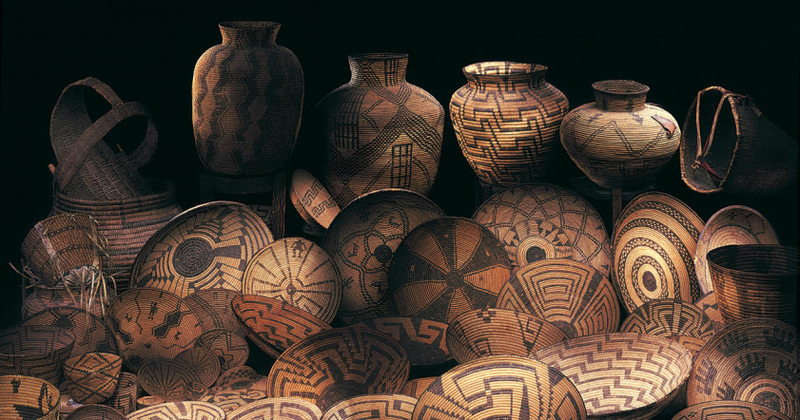 “Value [of Native-American baskets] is determined by beauty, a complex mix of qualities that are subjective and objective, as variable as their shapes and materials,” said Mark Sublette, founder of the Medicine Man Gallery in Tucson, Ariz., which specializes in Native American baskets and artworks. The kinds of natural fibers from which a basket is composed can decide what its design and color will be. as well as what construction technique the basketmaker might chooses to employ, he said. Baskets typically are plaited, twined or coiled. Yucca root fibers give a basket a deep red hue while sharp-thorned devil’s claw produces highly desirable brown to black for “negative designs.” Willow shoots, although originally white, will age through to yellow from exposure to sun and air. “Depending on origin, tribal relationship, and condition, quality Native American baskets range in value from $5,000 to $50,000,” according to syndicated columnist and antiques appraiser Dr Lori. She advises that buyers seek out examples in good condition and those having an authentic provenance. “There are a lot of cheap baskets out there that may look like the real thing, so do your homework and make sure you know your stuff before you buy,” Dr Lori says. Also affecting a basket’s value are how tight and fine the basket weave is (stitch count), its age and condition, who the maker was and its design. As basketry is a living art, contemporary examples are also sought after. “Today, most active collectors seek the rarest, finest and best examples their budget can afford,” wrote Jeff and Matt Wood in an online article on the website of Len Wood’s Indian Territory Gallery, Laguna Beach, California. Collectors of Native-American basketry share a mutual appreciation and passion for American history and craftsmanship, where a single skillfully-woven object can marry function and form with utility and art. They also are helping to keep an important cultural tradition alive.